Common issues that can result in a failed log in are listed below. If you have tried the solutions listed below and are still unable to log in to your transaction center or management console, please call Technical Support at (888) 417-8729 or email support@1stpaygateway.net . 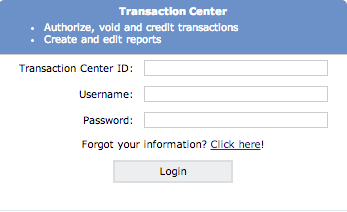 Both the transaction center and management console provide forgotten password links on the log in page. You can use these links to have a temporary password sent to the email address on record. Once you log in using a temporary password, you will be forced to change your password. Enter your user name in the Username box and click on the "Enter your username above, and then click here" link at the bottom of the page. Your temporary password will be sent to the main address where you receive the invoices from your Internet Store or BuyMe Buttons. Click the "Forgot Password? Click Here" link on the log in page. Enter your transaction center ID in the box given, and click Submit. Your temporary password will be sent to the email address where you receive your nightly batch reports. NOTE: This is only for the admin user of the account. All other users must contact the admin user to reset their password. All user names and passwords in the system are case-sensitive. Make sure your CAPS lock is off. If you copied the password from your log in email, be careful not to copy any added spaces either at the beginning or the end of the password. Try typing the password instead of copying and pasting the password. The management console and transaction center both store a cookie within your web browser to keep your authenticated session open. If your web browser is set to not accept cookies, you will not be able to log in to either the management console or transaction center. 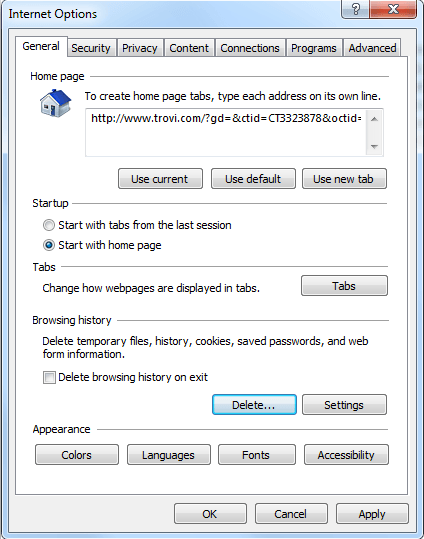 From your browser window, click the Tools icon Internet Options to open the Internet Options window. Click on the Privacy tab. 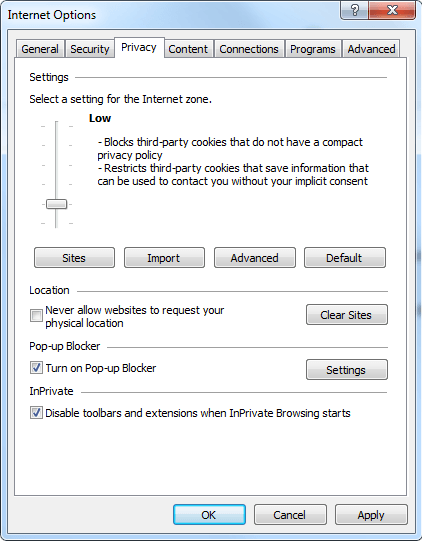 The privacy setting should be set to Low; if it is not, drag the slider bar down to Low. From your browser window, click the menu button and choose Preferences. Click on the Exceptions button; you'll be given a new window with a space to type in a website address. Enter the domain for the transaction center (https://secure.1stpaygateway.net) in this box, and click the Allow button. 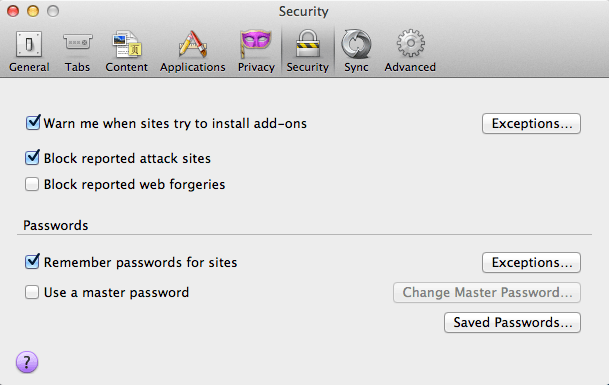 From the Safari Menu, click Safari and select Preferences to bring up the Preferences window. 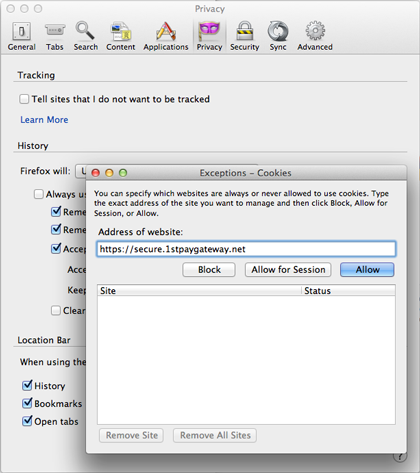 In the 'Block Cookies and other website data' section, click on the radio button next to 'From third parties and advertisers'. Make sure the check box next to Passwords is checked. 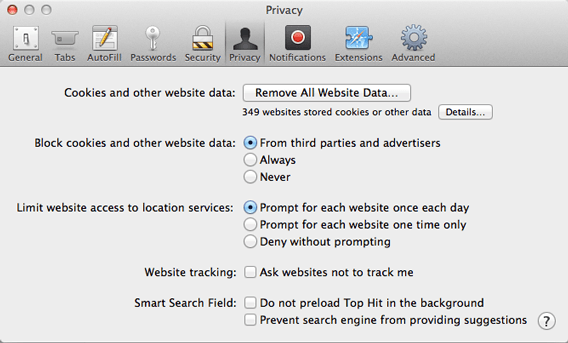 Do not check any other boxes if you do not wish to delete history, cookies, and other information. A list will appear with all of your saved passwords. Locate the one for https://secure.1stpaygateway.net/secure/login/tc/login.aspx? and select it. 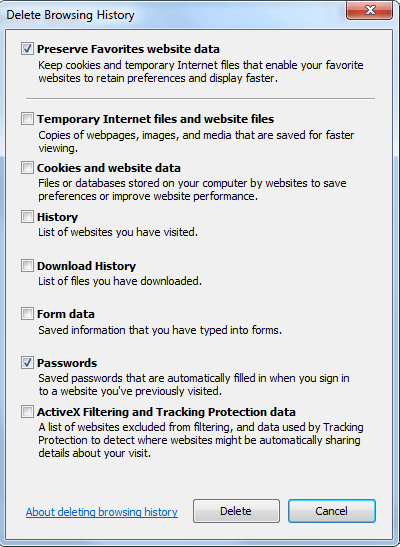 Click Safari and select Preferences. Navigate to the Passwords screen. Locate https://secure.1stpaygateway.net/secure/login/tc/login.aspx? and select it.